Scientists are constantly gathering large amounts of data in and about Antarctica. But how can the public access and use these data? The Norwegian Polar Institue has made an effort to make scientific data from Antarctica accessible for everybody by publishing Quantarctica” title=”Quantarctica” target=”_blank”>Quantarctica, a free open source GIS (geographic information system) to compile antarctic scientific data. The system is based on Quantum GIS and has data within oceanography, atmospheric science, geology and biology. As soon as the software is installed, it is possible to use Quantarctica offline. Scientific users can also upload their data to publish them quickly to a wide public. 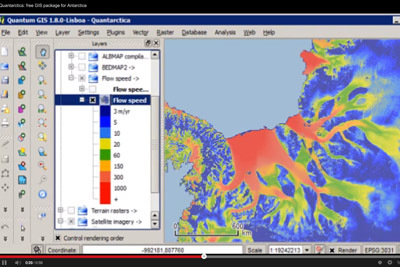 Quantarctica (Screenshot): free open source GIS with scientific data from various research branches in Antarctica. The Thwaites Glacier in West Antarctica has recently attracted considerable media attention, as scientists have predict it to collaps largely in the future. It is up to 4 kilometres thick and large enough to contribute with 1-2 metres to global sea level rise – a dramatic value. So far, warm sea water has been made responsible for glacier melting on the coast, but now there is evidence that a significant part of melting actually takes place at the glacier base, away from the coast. Thwaites Glacier is largely based well below sea level, as is the case for large parts of the West Antarctic ice shield, a fact that contributes to its lack of stability. Timing and duration of a collaps are, however, currently unknown, even though it seems widely accepted amongst scientists that a collaps is very likely. But one of the main influences on glacier dynamics were so far unknown: the geothermal heat flux from the underlying crust to the glacier ice. Until now, it has been believed that geothermal heat transfer is evenly distributed over the area of the underlying crust. Scientists of the Institute for Geophysics of the University of Texas at Austin have now revealed that this is anything but the case. Subglacial meltwater movement under the Thwaites Glacier was mapped with radar-based methods. The result is that meltwater production is very unevenly distributed. This can be used to calculate the geothermal heat flux under the glacier, which reaches values up to 200 milliwatts per square metre while averaging near 100 over the whole area. In comparison, the average value for all continents on Earth is just near 65 milliwatts per square metre. These values of geothermal heat flux are considered “significant” for glacier and ice sheet dynamics. 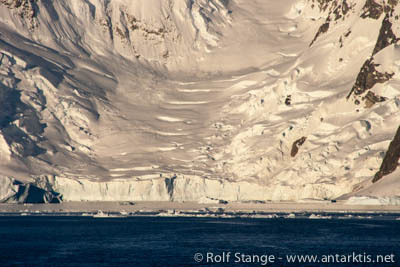 The Thwaites Glacier is accordingly loosing large volumes of ice due to melting at its base. The geothermal heat flux is not influenced by climate changes, as opposed to melting that takes place near the coast, in the contact zone with sea water which is getting increasingly warmer. It is the geology which is responsible for sub-glacial melting. Western Antarctica is geologically active. Scientists believe there is a rift system under the ice, similar to the Rift Valley of east Africa. This rift system involves increased magma movements in the crust and possibly volcanism at the glacier base, similar to volcanoes in Iceland. But of course scientists are trying to model the Thwaites Glacier to predict its future dynamics. The new knowledge about geothermal heat flux under the glacier will be a very valuable contribution to new models. Glacier in the Antarctic Peninsula: a dwarf compared to the Thwaites Glacier. They can’t just let it be: Japan’s conservative prime minister Shinzo Abe has declared to plead for a continuation of Japanese whaling. In early 2014, the highest UN court had declared Japanese whaling in its current form for illegal, as it is declared as scientific whaling, but is far from meeting any requirements to qualify as such. The verdict has, however, left the possibility open to organize a new whaling programme that could meet the requirements, which include a stronger focus on non-lethal methods and relevant publications. Abe is quoted saying that he wants to strengthen scientific research on whale populations and thus achieve new commercial whaling – remarkable how “scientific” and commercial whaling are connected in the perspective of the Japanese government. Abe also expressed it is sad that eating whale meat is not internationally recognized as part of Japanese culture. This part of Japanese culture does, however, enjoy only limited popularity even in Japan: demand for whale meat is lower than supply, despite commercial and even governmental promotion. 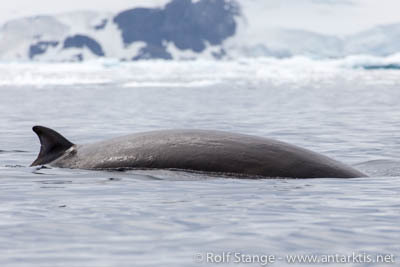 Minke whale in the Antarctic Peninsula. In 2005, Japan killed about 3500 Minke whales for “scientific purposes”.